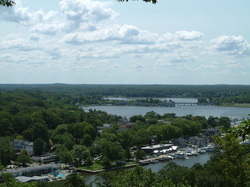 Aerial view of Saugatuck, Michigan. Public Domain Image. October 18, 2014 Tour: Shopping "local" in Saugatuck. We will take the colorful and scenic lakeshore down to Holland fora coffee stop, then on to Saugatuck. Lunch will hopefully be at or with the Saugatuck Women’s Club. We will then shop some more and end the day with dinner at Salt of the Earth in Fennville. Where: We’ll leave Muskegon about 9 am, and return about 7 pm. Cost: $80 per person maximum (to be determined by number of reservations). $25 non-refundable deposit. Included in cost: Bus, Tours, Lunch and Dinner.